Contact the owner John @ 918-688-5878 or benchmarkland@gmail.com.1964 Pearson Ariel - Ariel 205 completely rebuilt and refurbished. Sirocco is an Alberg designed vessel and she is an old Queen of the Chesapeake. I bought her in 2010. All soft spots in the deck were located and repaired with marine epoxy and new gelcoat. 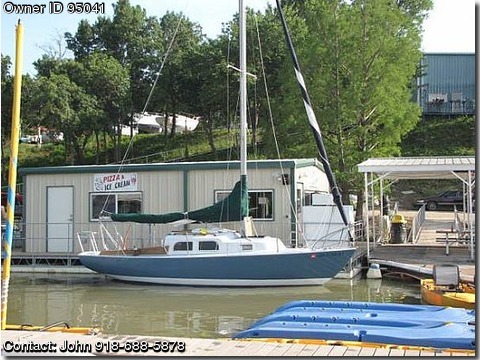 All stanchions, bright work and hard rigging, except her mast and boom were placed or serviced, sails cleaned and starched and she was outfitted with a new Kubota Beta Marine 18 hp inboard diesel that has less than 25 hours on it. I added an onboard and built in airconditioner, the interior was painted, she has new cushions throughout, all wood is teak and it has been serviced twice yearly with several coats of Cetol. Her bottom has a 5 year paint job, deck is white and her hull is painted with Stars and Stripes Blue marine paint. Sirocco is lovely, she's easy to sail and several have circumnavigated. 2010 Marine Survey is available. Replacement value is $51K and appraisal at $12K. My hands are too arthritic to sail. I will consider trading for a bass boat of similar or equal value.